Before the Ruin was one of my absolute favourite albums of last year and so the chance to see Kris Drever, John McCusker and Roddy Woomble perform it was irresistible. 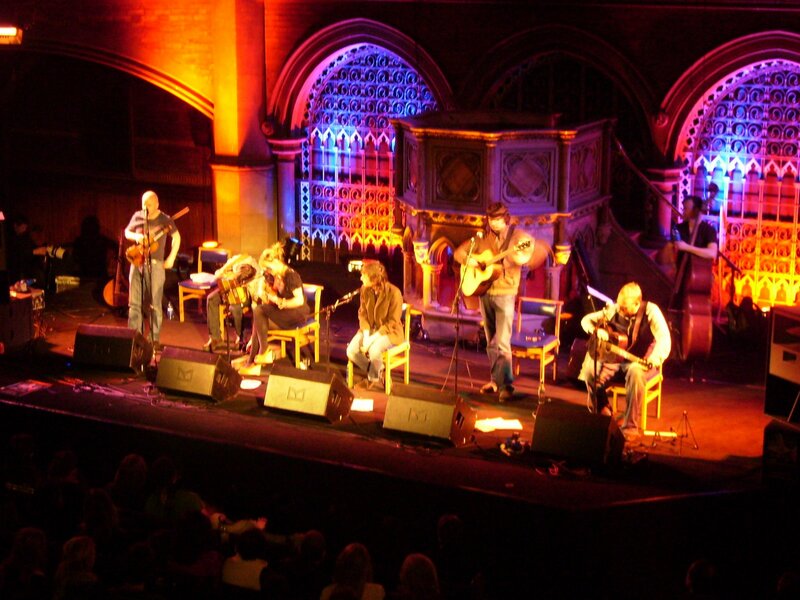 This was my first time at the Union Chapel on Highbury Corner and its reputation of being a fine, unusual and very musical venue is well founded – a great place to hear this sort of music. Whether in the pews downstairs or up in the gallery as we were, you are never far from the stage, and the sound is great in such a high and sympathetic venue. By the time we got in we had missed probably half of the set from openers Blue Rose Code, which was a pity. They sounded fine, in good voice, and you could hear their influences (no bad thing) , especially of the now sadly missed John Martyn for whom they performed a faithful version of his song Favourite Boy. Heidi Talbot quickly and rather diffidently took the stage next, initially accompanied only by Boo Hewerdine. Heidi’s crystal clear voice can be heard on Before the Ruin but tonight she performed some of the tracks from In Love and Light her latest album, starting with the track Cathedrals – with her great voice and some excellent guitar from Boo making an attention grabbing opener. Messrs Drever and McCusky joined them for more songs, filling out the sound with their impeccable playing of fiddle and guitar. Roddy Woomble joined for the closing number, and off they went – a fine set and Heidi’s vocal sounding even stronger than she does on record. After a short break they were all back, Woomble, McCusker and Drever accompanied by Boo Hewerdine and a double bass player ( I think Andy Seward – but I can’t be sure), with the album opener Silver and Gold. Heidi came back to add some welcome back up vocals and then Andy Cutting on diatoic accordian. We were treated to the majorityof the album, a couple of very welcome songs from Roddy Woomble’s album My Secret is my Silence and some tunes from McCusker, Drever and Cutting together as well as the fabulous Blackwater from Kris Drevers album of the same name. The playing and singing was uniformly superb – Woomble and Drever with outstanding voices, Drever with exemplary guitar and John McCusker on outstanding fiddle duty. In this kind of setting you see the influences that run through Roddy Woomble’s Idlewild – the more straight ahead rock band inflected with the scottish folk echoes. They are all worth catching, separately or in any combination. Quality will out – a fabulous gig. This entry was posted in Uncategorized and tagged Andy Cutting, Blue Rose Code, Boo Hewerdine, Gig, Heidi Talbot, John McCusker, Kris Drever, Roddy Woomble. Bookmark the permalink.